24"x36" oil painted in 1975. It was stolen in 1987. I kept these Lemurs when I worked as a zookeeper at the Tulsa Mohawk Park Zoo. This viewpoint is from the ground looking up as they head up a tree. Lovely.... A shame someone stole it :( But good that you have a good image of it. Maybe someday it will find it's way home. 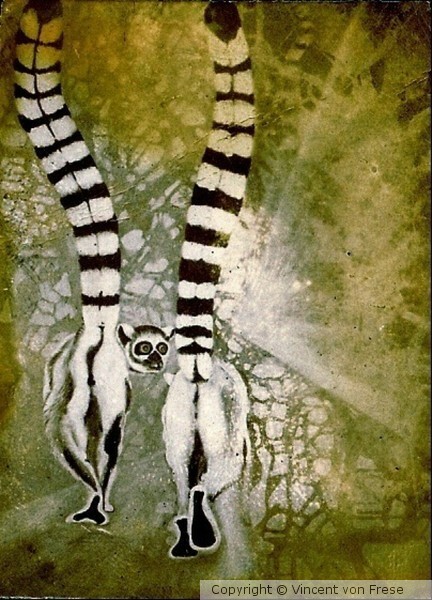 Artist Reply: Thank you John; It's Ring tailed Lemur(madagascar) from the ground view of them climbing up tree. I kept them at the zoo in Tulsa and love the sounds they make! This painting was stolen. It is 30"x36".